This is how insomnia feels like on some days. Today I was planning to watch the Aloha Parade in Waikiki but I had to yield to insufficient sleep at the intersection of my front door and Ala Wai Blvd. I've been having trouble sleeping recently as well. By the way, interesting find on that photo. 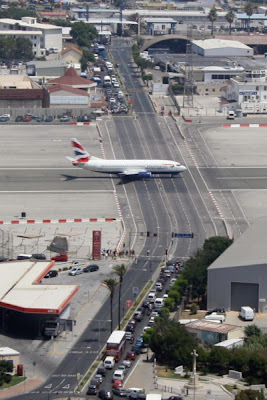 I've lived in towns where the road gets closed by the dropping arms for trains, but never for planes. Brad- you must visit Gibralter someday.